I grew up in Germany, mainly at the North Sea and in the Black Forest. I came to the US in 1982, and from the moment I stepped on American soil it became HOME. My Ex was an Officer in the US Military, and the Army relocated my family for the last time back to the US in 1998. This was my 3rd time around living in this country. Prior, we had lived nearly 3 years in Lawton Oklahoma, then moved back to Germany, and then again lived for almost 11 years in Kentucky, where I opened my own Gallery/Studio. Finally, when the call came to retire in KY, I felt it was good for the future to make one more important move to this part of the country. And let me tell you, it has proven to be more important than I could have imagined. What is something that you remember from childhood that has always inspired you? My drive to 'create', to paint or should I say to emulate my parents started very early on in life. One could always find me drawing, painting, cutting, and my imagination and passion held me captive for hours on end. However; Wolfgang Vogel, Art Professor and Teacher for Abstract and Contemporary Art, was my mentor and teacher, who took me under his wings when I was 11. He mentored me until I graduated with my Degree in Art/Photography. His influence is still evident in my paintings. I owe all of my fundamental art knowledge to him and even though he has long since passed away, I know he smiles down on me right now. Where is the most unusual surface that you have created a piece of art on? Since I am a Visual Artist who likes to 'think/work' outside the box, I would have to say that would have to be a huge contemporary commission in 1997, when I was actually working as Artist in Residence in Kentucky. As part of a Community Arts Grant, children and the staff of the Recreation Center helped me (at the lower level of the wall) to create one of the most stunning and colorful murals that impacted an entire community. What is this body of work about? The works I am exhibiting at Horseshoe for the months of April and May are really about my personal feelings and emotions. Oh my, what a difficult question. First of all it is classical music, which has been a constant source of entertainment in my family ever since I can remember. This is how I grew up in Germany. Second on the list is my husband Jim Cree, who is one of the very best drummers around. Also, No-One, and I mean NO-ONE ever comes close to who I call "THE Man", Eric Clapton. 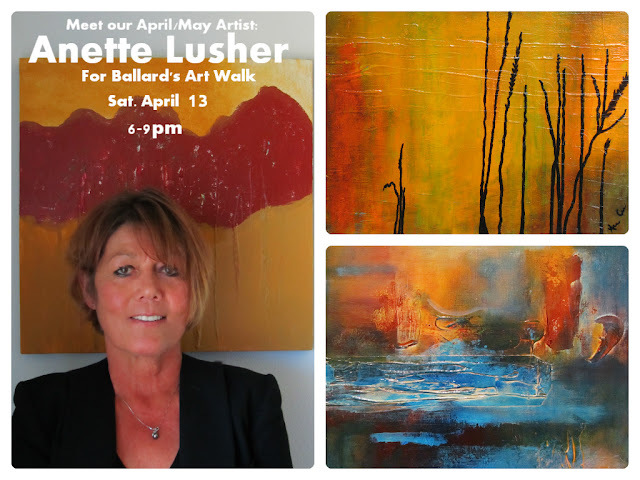 Please come meet Anette Lusher in person this Saturday evening from 6-9 pm at Horseshoe Boutique.